Fiberglass is a composite material made of glass filament and a plastic resin. 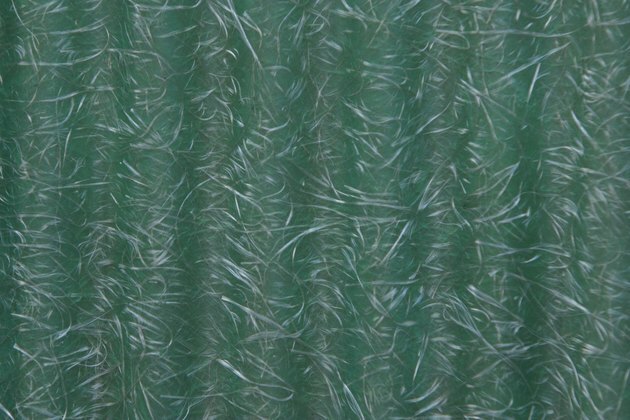 The glass filament is made of thin fibers of glass that are less than 25 micrometers in diameter. The bulk of the fiberglass is made of this filament. The resin holds the filaments together to form one solid piece of material. Polyester is the most common resin, with epoxy being somewhat less common. Polyester can be dissolved by many different chemicals, but epoxy is more resistant to most common chemicals. Fiberglass falls apart once the resin dissolves. Some storage tanks are made using fiberglass. Ethanol can cause the resin to dissolve if placed into a fiberglass tank with a polyester resin. Ethanol is sometimes mixed with other chemicals, so the fiberglass dissolving can be unexpected. For example, fiberglass fuel tanks on boats started to have issues with the fuel eating away the tank wall after ethanol was added to gasoline. It is one of the more commonly encountered chemicals that can dissolve fiberglass. Ethanol cannot dissolve epoxy resin fiberglass. Most strong acids can dissolve polyester resin, but they have little to no impact on epoxy resin. Strong acids include acetic acid, carbolic acid, hydrochloric acid, nitric acid and sulfuric acid. The concentration of the acid has a direct impact on whether it dissolves the resin and at what rate. For example, a solution that contains 10 percent hydrochloric acid is not going to dissolve the polyester resin. A solution with 38 percent hydrochloric acid is going to dissolve the resin slowly when in contact with the fiberglass. Concentrated hydrochloric acid would quickly dissolve the resin. Most strong bases dissolve polyester resin, but do not affect epoxy resin. Strong bases include potassium hydroxide and sodium hydroxide. Strong bases do not need to be as concentrated as acids to dissolve polyester resin. A 30 percent solution of potassium hydroxide or sodium hydroxide would quickly dissolve the resin, while a comparative acid would dissolve the same piece of fiberglass at a much slower rate. Aqua regia is a mixture of nitric acid and hydrochloric acid that is extremely corrosive. The name means "royal water" in Latin, referring to its ability to dissolve the noble metals that can resist almost every other chemical. Aqua regia would quickly dissolve polyester resin. Unlike the two acids used to make it, aqua regia can also dissolve epoxy.